As financial advisors, the biggest concern for our clients is usually planning for how to cover retirement expenses, and in doing this retirement planning, one of the top considerations is the hierarchy of accounts liquidated in order to cover expenses. To better meet the needs of advisors who are analyzing retirement distribution scenarios, Advizr recently added a feature in the Recommendations section of the Financial Plan called “Distributions”, which can be found in the What If’s area of the Retirement goal. Initially, the hierarchy of distributions is maximized for tax-efficiency, which will probably be the best order for most of your clients. It begins with taxable brokerage accounts in order of balance from smallest balance to largest, and includes even brokerage accounts that might be earmarked towards other goals. The assumption we’ve made here is that if a client does not use up all of the funds in an account earmarked for buying a home or a boat or some other big purchase, they would most likely re-purpose the account for their other goals, the primary (and usually last) goal being retirement. If this turns out not to be the case for a particular client of yours, you’ll be able to remove that account from the list of accounts that can help fund retirement. After taxable brokerage accounts, the next tranche of accounts are tax-deferred accounts, including 403(b)s, 401(k), traditional and SEP IRAs, etc. These are prioritized over tax-free accounts such as Roth IRAs and Roth 401(k)s in order to let those accounts accumulate and compound tax-free earnings for as long as possible. In some client situations, though, it may make more sense to distribute a particular tax-free account first, or to intersperse taxable account distributions with tax-deferred distributions in order to better manage tax brackets during retirement. Let’s take a client named Jamie Lee, who plans to retire from the business they own in about 15 years from now. Jamie plans to sell the business and may end up with much higher income for the first 5-10 years of retirement due to payments made towards the purchase of the business. In this case, if Jamie doesn’t have enough in taxable account balances plus payments from the business purchase to fund those first 5-10 years of retirement expenses, but Jamie does have significant balances in Roth-type accounts, Jamie may want to use up the Roth accounts first before dipping into tax-deferred accounts that will increase Jamie’s tax bracket during those higher income-earning years. In cases like these, advisors are now able to simulate a different order of distribution of the accounts than a simple tax-efficient hierarchy, and then will be able to view the impacts of their proposals on the plan via the various graphs and charts we provide, such as the Retirement Assets graph and the Projected Assets report. 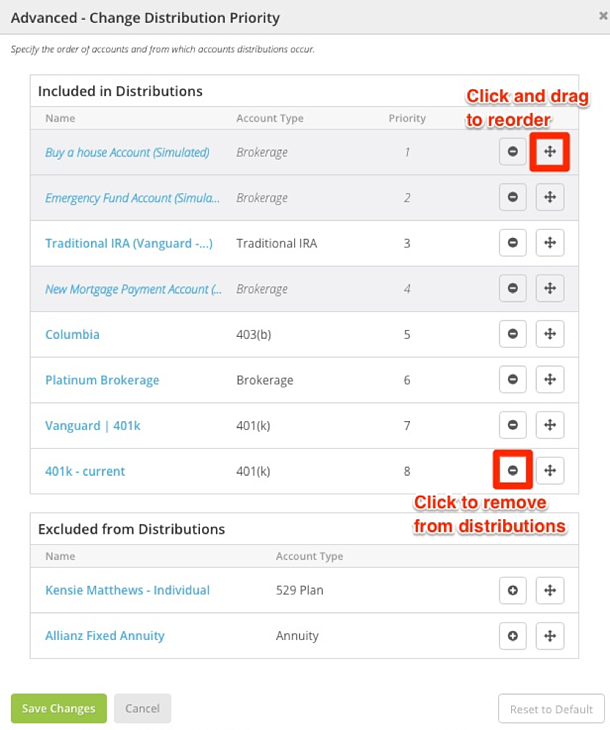 Users can remove certain accounts from the hierarchy and rearrange the order of distribution, simply by clicking on the “More” button below the first three accounts listed on the Distributions page. We’ll refine this feature over the next several months, so please try out the new tool and let us know what you think! As always, we take your feedback very seriously as we continue to enhance our platform.